In The Green Door by O. Henry we have the theme of adventure, convention, good fortune, fear, risk and uncertainty. Narrated in the first person by an unnamed narrator the reader realises from the beginning of the story that Henry may be exploring the theme of adventure. The narrator views people in two categories those who will live their life seeking adventure and those who will live as convention dictates. Rudolf Steiner is an adventurer and is prepared to risk his life as he travels through the city in search of adventure. It is as though Rudolf lives for adventure. He has a day job selling pianos but his evenings are free to roam the city and see what form of adventure he might find. It is also possible that Henry is suggesting that with adventure can come good fortune. When Rudolph realises every door in the building is green he still counts his blessings for knocking on the young woman’s door. He knows that he will meet her again and the reader senses that Rudolph may pursue a relationship with the young woman. For Rudolph that is one of the benefits of an adventure. Meeting new people and expanding his horizons. Which may be the point that Henry is attempting to make. He may be suggesting that those who live their life conventionally have a limited outlook on life. They conform to the norm and as such do not afford themselves the opportunity to explore further the world around them. If anything Henry may be suggesting that the majority of people live their life in a conventional manner because they are afraid to take risks. Which is understandable. However should a person never take risks they will live a closeted life not knowing what might have been. Dreams will remain unfulfilled and opportunities will be lost. Though in fairness to those who do not seek adventure and who prefer to live their life conventionally. The risks and losses should one pursue adventure can be great. Not every adventure is going to be rewarding as Rudolph’s. 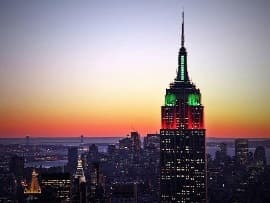 Rudolph could have ended up knocking on any of the green doors in the building if he had first noticed them and his adventure might not have turned out as pleasant. That is the risk that an individual must take and for many that is a price that is too high. It is easier to live conventionally and follow a routine that does not deviate from what is accepted by society. Adventure is not made for everyone though the rewards can be great as can be seen with Rudolph. Rudolph as mentioned is able to live two separate lives. He has one foot firmly rooted in convention and the other is constantly seeking adventure. Rudolph has a balance that many would find difficult to achieve. It also helps that Rudolph has no responsibilities. He has no wife or children so he can afford to take the risks that are required when it comes to adventure. He can spend an evening walking the city and jumping from place to place in pursuit of an adventure and it will not affect anybody. He has no clock apart from his employers that he is answerable to. He also has a wealth of experience from each adventure that he has undertaken. Some of the experience is good while other adventures have been negative. Which would play on the theme of risk again. In reality Rudolph does not know where life is going to take him. His destination is uncertain and Rudolph likes this. He is living his life outside the norm. It might also be case that Henry is suggesting that people should try and think outside the box. Though there is a simple explanation for the card that Rudolph received. By looking the other way on the street Rudolph missed the theatre and found the young woman’s apartment. If anything Henry could be highlighting how different a person’s day or life could be if they changed their way of thinking or the direction they may be going. Though again there are limitations to this. It is not practical for a lot of people to seek adventure due to either work or family commitments. As mentioned Rudolph has had a stroke of good fortune. Chance has been good to him. He may or may not have a successful relationship with the young woman but at least he has allowed himself the possibility of exploring a relationship with her. Something that was only made possible by Rudolph’s sense of adventure. The road that Rudolph takes may be fruitless but again he has afforded himself the opportunity of changing the direction of his life all because he believed in adventure. While others might grumble about their life due to the lack of excitement it might hold. Rudolph is the opposite. Everything is an adventure for Rudolph. With some adventures paying off and some being lessons that Rudolph has learnt from. McManus, Dermot. "The Green Door by O. Henry." The Sitting Bee. The Sitting Bee, 21 Feb. 2018. Web.